"The terrorists’ missiles contained poisonous gases, which proves that the terrorists possess chemical weapons," the governor said, as quoted by Al Ekhbariya broadcaster, when he arrived at the ar-Razi hospital where the victims were hospitalized. On Saturday, militants from terrorist groups fired shells at neighborhoods of al-Khalidiye and Al Zahraa as well as the Nile Street. At least four children were hospitalized with asphyxiation and other symptoms typical for poisoning. 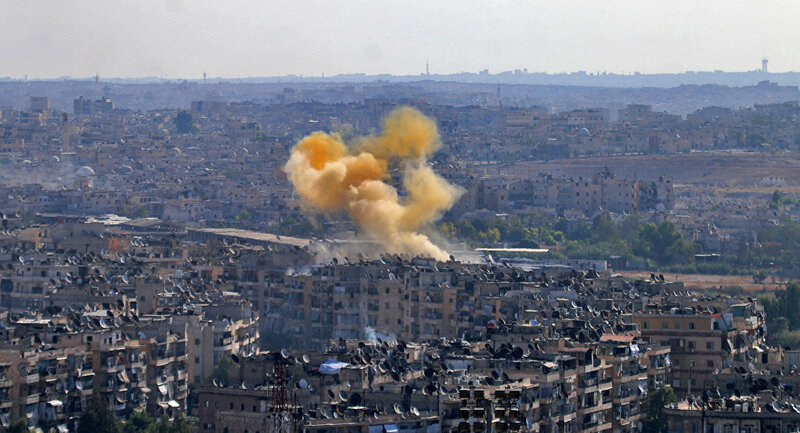 The head of the health department of the Syrian city of Aleppo, Ziad Haj Taha, said Saturday that 50 residents of the city were injured in the attack by militants with chlorine-filled shells at the city's residential areas. "Of those injured, 25 were hospitalized to ar-Razi hospital, 25 to Aleppo University Hospital. Ambulance services continue to provide assistance to victims of poison gas use by terrorist groups, presumably chlorine," Taha said. Meanwhile, the number of victims with poisoning symptoms has reached 55, local media reported Sunday. The city of Aleppo was liberated by the Syrian government troops from militant and terror groups in 2016 but militants continue to shell the city from their positions in Aleppo’s suburbs.